Are you looking for the Family and Children or the Christenings FAQ instead? Your online gallery is where you can view, share, and download images (if your package allows), and also order prints! If you need help ordering prints, or downloading your images, please have a look at our extensive knowledgebase or give me a call at 99938358. Why choose Sweetmama for my newborn baby’s session? I have extensive experience in photographing newborns, and can therefore pose newborns with safety. I have every prop anyone would need for a newborn session. I have trained with some of the top newborn photographers in the world, so I can deliver world-class newborn photography. I exclusively photograph newborns and families, so that I concentrate on doing it well. In fact, Sweetmama is among a handful of professional photographers in Cyprus who specialize exclusively in the art of newborn photography! When is the best time to book a newborn session? It is important to note that newborns are best photographed within the first 20 days from their arrival, and ideally when they are around 10 days old. This is the time when the little one is asleep the most, which makes it easier to wrap, try various poses, move around, and scrunch them into those sweet, serene, curly poses we are looking forward to capturing. You can contact us ahead of time so we can note down your due date; in this way we will keep a few days free around your due day, and we will do the final arrangements for your session once your little bundle of joy arrives. This is the best way to accommodate for early, or late arrivals. Please book your session as soon as you can while you’re pregnant, rather than waiting until your baby is born as there is a possibility we might not have any free slots for your shoot. Where do portrait sessions take place? Our sessions are either indoor or outdoor. The choice between Indoor or outdoor is yours. Indoor sessions are held in Sweetmama’s Natural Light Studio. Our Studio is ideally located in the outskirts of Larnaca so as to cater for our clients from all major cities (30 minutes from Limassol and Nicosia and 10 minutes from Larnaca). Our studio is the only professional studio in Cyprus where the key light is natural light, which is the most important ingrednient in the soft, natural look of our portraits. We use specific outdoor locations around Cyprus. We have preferred locations we photograph in all districts. We are always open to suggestions about new locations. Especially for our clients from abroad we can arrange a pickup service to and from the photo-shoot’s location. A newborn session can last up to four hours. During this time, the baby will feed several times, have diapers changed and fall in and out of sleep plenty of times. Thus we will have various opportunities to change poses and wraps. How about my baby’s peeling skin and the umbilical cord? Will they show? Absolutely not. Indeed, babies at this age usually have acne and peeling skin. You do not need to worry as we can really remove anything through the processing of the photos. Additionally we can pose the baby in a way that will disguise the umbilical cord. 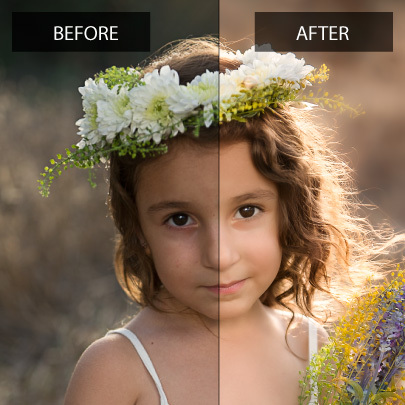 Do you edit (retouch) your photos? Yes we do! We strongly believe that retouching can transform a good picture into a masterpiece! In fact we have a whole section dedicated to our retouching process, where you will also find some before-and-after demos! Do we need to bring any props? No, you do not. As a client you will select to use in your session from our extensive range of cotton wraps, mohair nests, baskets, buckets, wooden crates, vintage buckets, blankets, faux furs, hairbands and hats! Our prop collection is perhaps the largest of its kind on the island. What can I do to help during the session? The only time we will ask for your help will be when the baby needs feeding. Other than this, you can take advantage of the opportunity and get some rest, or have a shower! Or simply sit back, and relax! Being a mother of two children, and having experience with tens of newborns, I want to assure you that your baby’s safety and comfort is my top priority. One of the reasons I bring an assistant to my newborn sessions is to ensure the baby’s safety: one of us is always just centimeters away from the little one while the other takes the photographs. All poses I attempt are safe and comfortable for baby: babies are flexible at this age and can be positioned very easily while asleep. If you feel uncomfortable with any specific poses, then I will not attempt them. If you are still concerned about safety I would love to connect you with some of my other clients who would surely put your mind at ease. We are glad you asked. You can definitely bring your pet! They are part of the family, after all. Please do mention this during our pre-consultation session. What is your payment policy, and other Terms of Service? Can other members of the family take part in the shoot as well? Siblings and grand-parents are welcome to join the session! Please do inform me before the session so I can better plan poses. Make sure they are dressed in solid, neutral colors, with no patterns or logos on them. I suggest bringing younger siblings either at the beginning or the end of the session. When they are not being photographed, you might consider arranging someone taking them away from the area where the session is taking place. A calm environment is essential and only those taking part in the session should be present at any time. Can we work around my baby’s routine? Absolutely! We can arrange to arrive at your house based on your routine. The best time to arrive would be during a feed; by the time the baby is fed and asleep, we will have our setup ready. What if baby doesn’t sleep during the session? If your baby is warm (ideal room temperature for a newborn session is between 28-30 degrees Celsius) and fed, he or she will soon fall into deep sleep. Baby might need some time to relax, or go through various circles of wake and sleep, and this is why we plan our sessions to last up to 4 hours. What is a “pre-consultation session”? Once you book your session, we will have a a pre-consultation session by email or over the phone during which we discuss props, styles, favorite colors, how you can best prepare baby for the shoot, outfits and clothing, and any special requirements you may have. Specifically for Newborn sessions, you will receive my Preparation Booklet with plenty of useful information on how you can best prepare for the session. How should I backup my high-resolution image files? We advise that you copy your image files on multiple storage devices such as DVDs, external hard-disks, and flash-drives (USB sticks). Keeping your images on a single device is extremely risky, as both DVDs and hard-disks fail very often, and USB sticks can be lost. The average lifespan of DVDs and hard-disks is between 5-10 years. With regards to external hard-disk drives, we advise using external drives with dedicated power cord (also called non-portable external hard-disks, or AC-powered), as they tend to be more reliable than the portable ones that do not have an AC plug. You may also consider an online backup solution such as dropbox, or box.net (both of which offer a free account) or crashplan, which offers a yearly subscription package for unlimited storage. If you plan to backup the images online, please make certain the service you are uploading to does not process the images in any manner that reduces their file-size or strips out ICC data, as this will alter the colours and quality of the photos. (As an example, at the time of writing this, Google drive strips out ICC-data, and as a result changes the images’ colours). Kindly note that the high-resolution image files are given to you under a Personal use licence, and for archiving purposes. Personal use means non-commercial use of the images for display on personal websites and computers, or making prints for personal use. The images may not be used for commercial purpose of any kind (such as to create advertising material or any other marketing collateral for your business, or any other businesses). This also includes other businesses involved in your event, such as cake and candy-table designers, event planner, florist, decorator, and the restaurant/venue. Therefore, please do not give any of these images (especially the un-watermarked high-resolution image files) to any businesses. Please do note that in the spirit of collaboration with other businesses we will allow use of our images by other businesses granted that they themselves ask permission from Sweetmama Photography describing the intended use and agreeing to crediting Sweetmama Photography as per our policies. If a service provider in your event requests use of any of our images for promotional purposes, kindly ask them to contact us directly. Under the European Intellectual Property Law the copyright of images remains with the photographer, who licenses these images under a personal usage license. This means that regardless of what or who is depicted in the image, title and ownership, and all rights now and in the future, of and for the images remain exclusively with Sweetmama Photography.